The bike was running when I bought it and before I declared it Sorn. (I’m now thinking this may have been due to divine intervention!) It is not an ES model. I have electronic ignition, no zener diode as far as I can see, but I do have a Yamaha 42x-a1 regulator/rectifier unit. I also have the original Lucas 3DS rectifier. There is no fuse at all. The wiring seems to be all over the place so I’m thinking of re-wiring the whole bike and have been looking at wiring diagrams. I cannot see an ‘Ignition Amplifier’ or ‘Transducer’ - what do these look like and are they called something more familiar as I don’t know what these are! They are in the points cover...assuming you have electronic ignition. If you have the Yamaha unit then the Lucas one should not be wired up. Zeners also wouldn't be needed, but they are on the back of the alloy air cleaner housing and are probably the 3 pack ones [I think for an '81]. Going on your post, I don't think it would be wise to try rewiring the bike until you understand/work out what you have. (Where women blow and men chunder). It is not an ES model. no zener diode as far as I can see, but I do have a Yamaha 42x-a1 regulator/rectifier unit. I also have the original Lucas 3DS rectifier. Is the rectifier actually connected - White/Green, Green/Yellow and Green/Black wires to the three 1/4"-wide spade terminals, Brown/Blue wire to the 3/8"-wide spade? On an '81, the three Zener diodes are a strip, one connected to each of the wires between alternator and rectifier. If you follow the Black cable from where it emerges from the inner face of the primary chaincase to where the White/Green, Green/Yellow and Green/Black wires emerge from the Black insulation, are there three wires of each colour combo.? If so, one's from the alternator, one goes/went to the rectifier or goes to the Yam reg./rec. and the third goes/went to a Zener on the aforementioned strip. "Amplifier" is what Lucas called the 'electronics box' of their RITA electronic ignition. 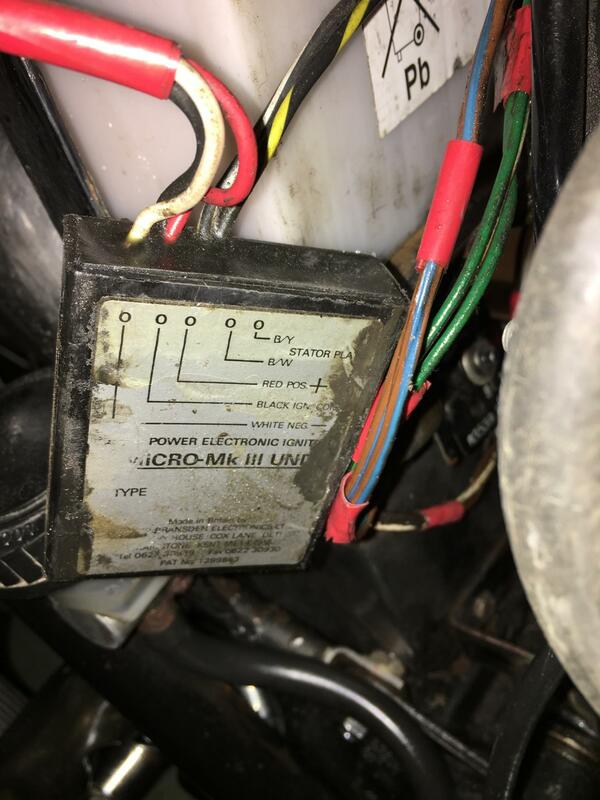 Enter "lucas rita ab11 amplifier" into your preferred internet search engine and look at the returned images; if your bike still has one, you should find it behind one of the sidepanels. "Transducer" is what Lucas called the triggering unit of their RITA electronic ignition. If you look at the right-hand side of the engine, you should see a circular cover in to the top forward corner of the larger engine side cover. Enter "lucas 5pu" into your preferred internet search engine and, again, look at the returned images; if your bike still has a 5PU, you should find it behind that small circular cover. There is no fuse at all. My preferred option even when the wiring hasn't been messed with; Lucas made some ill-considered changes to later wiring harnesses. A basic rewire's easy to do if you can at least work methodically. What's your experience, what would you like to end up with, etc.? Last edited by StuartMac; 04-09-2019 at 01:50 AM. Hi and thanks for the swift replies. I'll have a look later and double check the wiring colours etc, but I'm pretty sure there is no amplifier unit. I'll check for a 5PU later after work. I should add that there is also no airbox (for the zener to attach to), and I don't intend on using one as I'd like to put retro side panels on with a splayed head and pancake filters. I have no experience of wiring but my brother is a trained mechanic and a basic rewire should not be beyond the two of us with a methodical approach and a new Lucas loom which seem to be pretty easily sourced from Ebay etc but the question here is are they to be trusted as correct and worthwhile? Another alternative is to call on the professional services of someone like 'The Ferret' who I'm sure would do a top class job but would likely be very expensive! No Rita amp., no 5PU, the two go together. If there isn't any 'electronics box' at all - most replacement e.i. 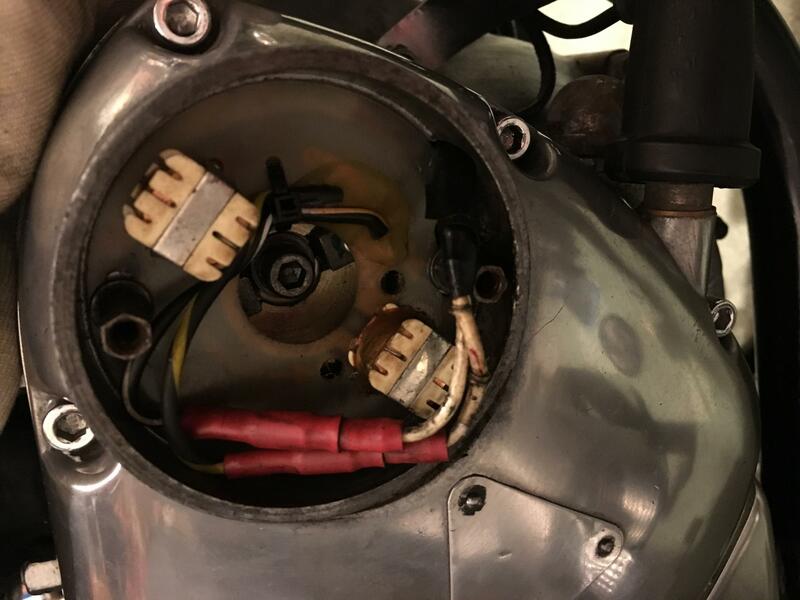 have Red, White, Black, Black/White and Black/Yellow wires - chances are the bike has a Tri-Spark 'Classic Twin' e.i., the electronics for that are all in the aforementioned circular compartment in the engine timing cover. Be aware that the company - Wassell - currently licensed to use the "Lucas" branding and packaging never had anything to do with the 'original Lucas' that made your bike's original electrics. Wassell have a long-time poor reputation for quality control. If you must buy an off-the shelf loom, I recommend buying specifically from TMS, their looms are made down the road by Autosparks. TMS also sell several other alternative electrical parts to those wholesaled by 'Wassell Lucas', look for "MADE IN UK' in their descriptions and often "/UK" in the "Code" column. Btw, no connection except as a TMS customer and a very Wassell one. The disadvantage with any off-the-shelf loom is it'll incorporate all the aforementioned "ill-considered changes". 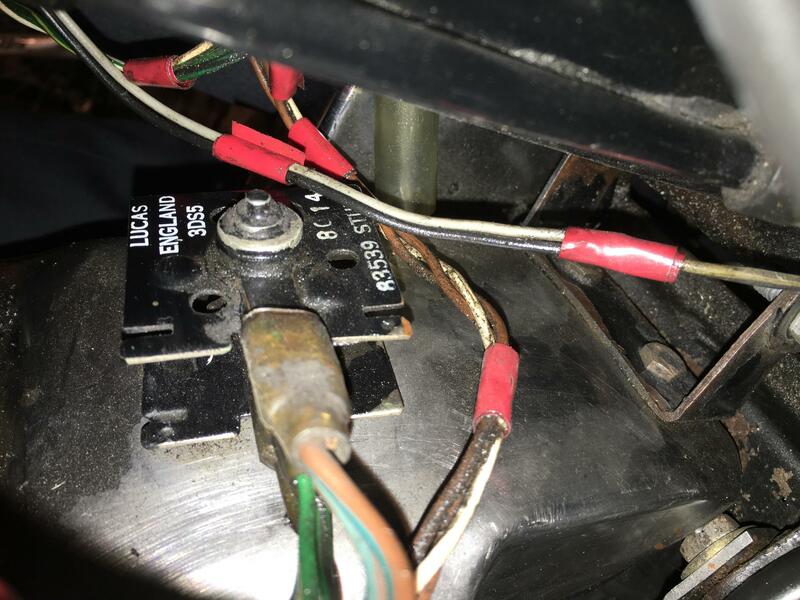 One of the big disadvantages is, even if you're happy with the standard single-fuse-for-everything, its standard position in the Brown/Blue wire attached to battery +ve (on your bike) can't protect against a particular common type of short-circuit. I've used both Autosparks and Vehicle Wiring Products for components and tools for decades without any problems at all. If I'm rewiring a bike I haven't done before, and the old loom's still connected, I start by using a sharp scalpel-type knife to cut away any wrapping; once the loom's visible in Glorious Technicolor, it's much easier to make sense of the any wiring diagram's black lines. Then I just replace one wire at a time, upgrading, shortening/lengthening, removing/adding connections, etc. as required. E.g. as standard, the aforementioned Brown/Blue wire and corresponding Black wire to battery -ve are too low-rated for the Amps even the standard alternator can generate, never mind if you decide to upgrade to a higher-output one. By-and-large, I never cover any loom I build, makes testing and upgrading (and repairs ... ) far more difficult than necessary. I simply strap new wires to frame tubes with releasable reusable cable ties; once the loom's finished and tested, any wires still exposed after replacing tank, seat, sidepanels, I cover with lengths of 'split' flexible conduit (available from both Autosparks and VWP - the split is lengthways along the conduit, so it can simply be slipped over/off already-connected wires. 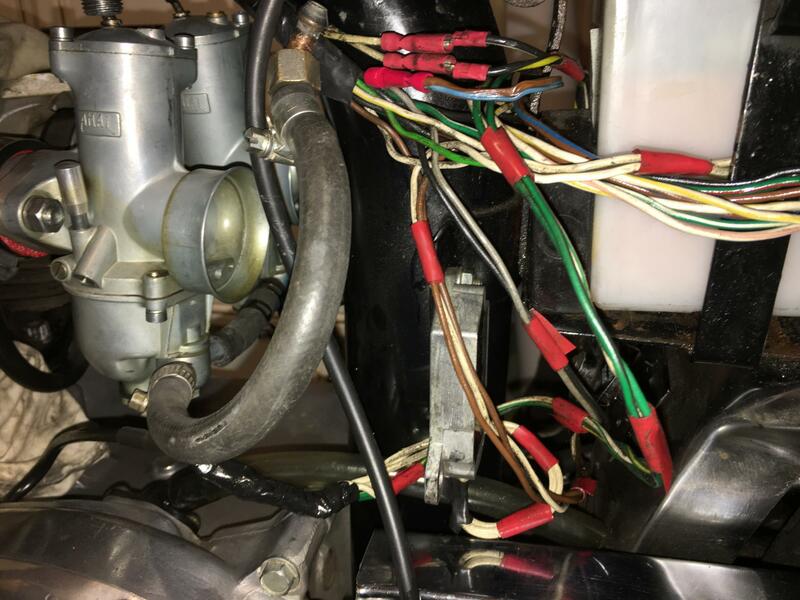 What do you do with the handlebar switch wiring Stuart? Not sure why but some are rotating 90* when I post them..? Someone's already been in there and done some wiring.